“Thailand is infested with foreign teachers who have troubles in their home country,” I once heard from a foreign friend when I was just starting out a few years ago. He said that these so called teachers, apart from having fake documents, come to Thailand to hide and escape prosecution. Although I partly believed him, I didn’t realize I will one day see one. British national Robert David Hastings, 61, was apprehended by the police at Kumphawapi school in tambon Kumphawapi of Kumphawapi district in Udon Thani, where he worked as an English teacher, on Tuesday afternoon. The following day, he was taken to a police conference at the immigration bureau in Bangkok. According to a Bangkok Post report, Hastings arrived in Thailand 9 years ago. He has 17 arrest warrants on record in Britain – 12 of which on charges of sexual abuse and five alleging indecency with a child under the age of 14. 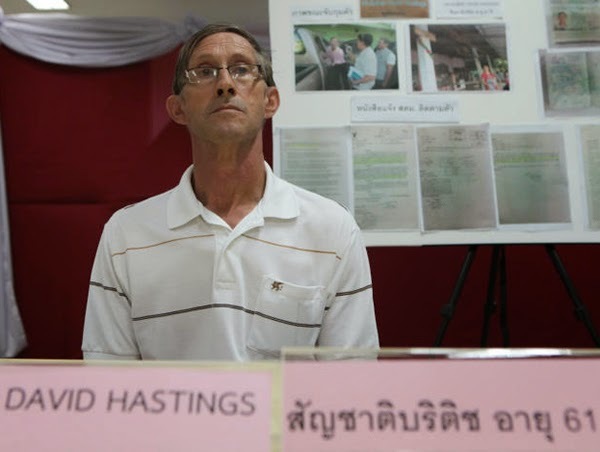 Lt Gen Sakda Chuenpakdi, acting Immigration Bureau chief, said Mr Hastings entered Thailand through Nong Khai immigration checkpoint and was employed to teach at the school until March 31 next year. The British suspect came to Thailand in 2005 and has a Thai wife. According to Hastings, he contacted UK police because he was wiling to fly home to face the charges filed against him. But he didn’t have money for tickets. He asked them if they can cover the cost of travel however, there was no response from the UK authorities until Thai police apprehended him. Note: I have a daughter and I wouldn’t want her to have a teacher who have issues like this. This is alarming in the highest degree!